Koi Garden: Hibernation is not in the cards!!! Hibernation is not in the cards!!! We are in the midst of a mid winter thaw or an early spring. It really makes no difference which as either way it has a great effect on the Koi Garden. First it was the Crocuses.... Really gorgeous ones, they are just too early. Next it was the Cherry trees and their blossoms. The cherry trees are blooming very early, in fact most are already dropping their petals. 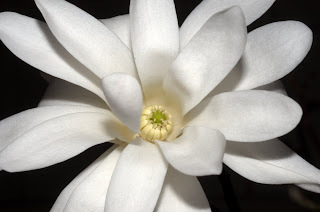 Now even the earliest of the Magnolia trees, the Starlota is already in full bloom. Definitely not your typical Koi Garden in February. But there is a negative side to all this great weather. Pollen counts have risen precariously; and with it come the allergies. Allergies affect the Koi Garden guy, but I am guessing that the fish don’t suffer from the same malady (at least I have received no requests from the Koi for Benadryl). But there are some negative aspects of the early warm weather on the Koi Garden. The pond water that was green most of the year, has never really gotten cold enough, long enough, to kill all the algae and clear up. Therefore the water has stayed green, maybe even gotten more so instead of a normal winter where the cold water clears up all the algae. Checking the water chemical levels is not something I bother to do too often in the winter, but with the spring temperatures and green water, I figure I had better do so. After checking with the test strips, only the Nitrates appear high. Since the Nitrites and Ammonia are not high I am less worried about the high Nitrates. A higher Nitrate indicator essentially means that plants would do well in the water. Well, Algae is a plant and I already know it is doing really well, too well; hence the problem. If the rest of the chemicals levels are good, the green water is not a show stopper problem, but what good are fish if you cannot see them??? The water temperature is now near 50 degrees. If this is true, I will have to start thinking about feeding the fish as they will no longer be dormant and will be hungry! Normally these are issues we deal with in April, not late February or early March. Previous testing indicated to me that the water temperature indicator runs about 5 degree too high. This means I will hold off feeding the fish for a little longer. I may even turn on the filter heater if the pond temperature starts fluctuating each day. 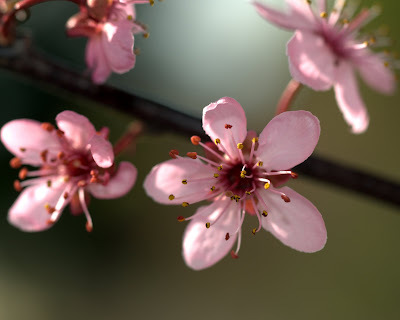 So much for the long dormant winter…..
Those are some gorgeous flower shots! What lens did you use if you don't mind my asking? Thanks for the comment and the question about the photos. 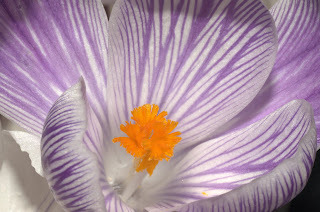 The Crocus was with the Nikon 55mm f/2.8 MF with the extension tube. The other two were same lens without the ext. great pix of dropdead flowers enlarged!